For hikers who enjoy a true challenge, the Big Southeastern Appalachian Loop (please, internet, find a better name) would be by far the most challenging of the "small" loops. This is a tough loop because it has the most incomplete trails, meaning there are some significant roadwalks. On the plus side, resupply is overall fairly easy. With so many miles, it might be hard to find the perfect time of year to hike this loop. From the GET/Georgia Pinhoti Trail divergence near Taliaferro Creek, a counterclockwise hiker would stay on the Georgia Pinhoti, following it roughly 120 miles to its intersection with the Benton MacKaye Trail (pictured on right). At Springer, the loop would follow the Appalachian Trail north to Pearisburg, Virginia. This portion of trail is about 630 miles long. From Pearisburg, the hiker then navigates the most challenging section of Great Eastern Trail: southern West Virginia's roughly 150 miles. Kentucky's Pine Mountain Trail and connecting roadwalks on either end add up to about 170 miles. 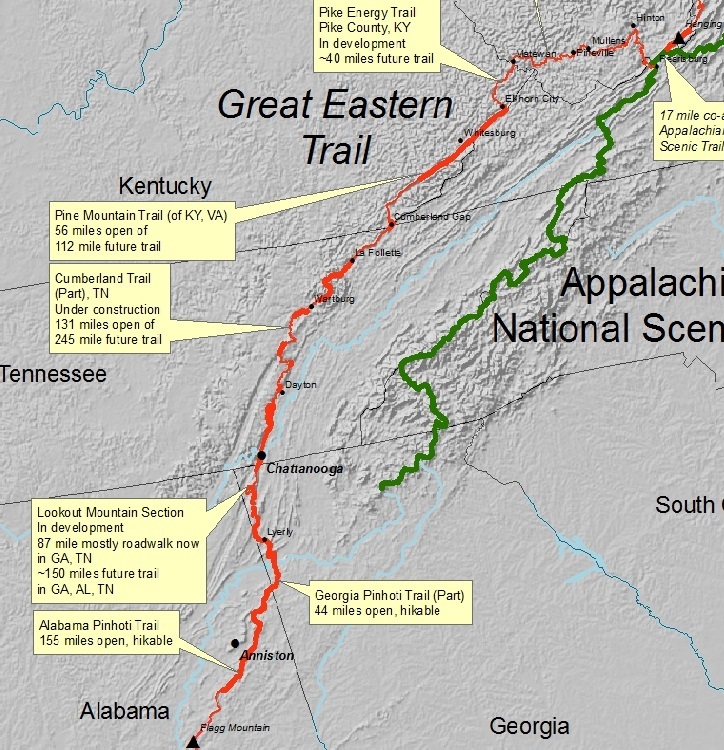 The Cumberland Trail will be roughly 260 miles, depending on roadwalks and trail closures. It may be slightly more or less than that, but 260 is a good estimate. Lookout Mountain Section is about 100 miles (if following newer route through Little River Canyon) to meet up with the Georgia Pinhoti/GET divergence at Taliaferro Creek. That equals a whopping 1,500-mile loop. Why should I hike this? : No other GET loop will give hikers such a wide variety of trail experiences. From the popular, perhaps over-loved Appalachian Trail to the wilderness Benton MacKaye Trail to the unfinished choose-your-own-adventure style of the GET in West Virginia, this loop has everything. Where should I begin? : Because this is the most challenging section of the GET, I'd recommend starting anywhere else: The Georgia Pinhoti would be a great place or Springer Mountain/Pearisburg would be ideal depending upon direction hiked. What guides are needed? 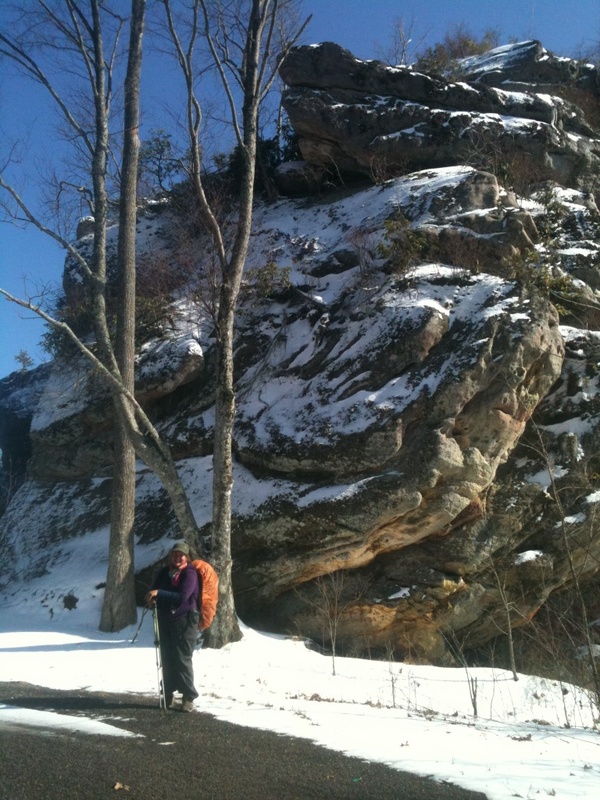 : Hikers will need an AT guide, the BMT guide, a GA Pinhoti guide, and all the GET resources for WV, KY, TN, and GA listed under our Guides Page.